Andrea Geller's 'The Bath Series' portrays three stages in the ritual of an intimate bathing experience: preparation, immersion in the bath, and emergence. The bath is a sanctuary, with sound, light, color and motion synthesizing to inspire renewal of body, mind and spirit. Each stage of the bath experience captures a different state of mind. 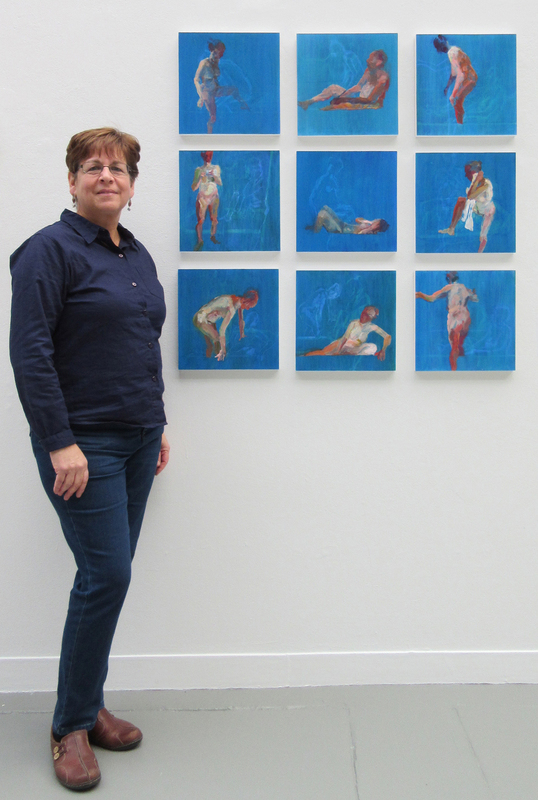 Each piece in the series contains multiple figures in differing degrees of visibility, with some having been painted in and wiped off to represent a narrative in the temporal dimension. All the panels are oil on cradled wood and measure 12" by 12". The compositions are designed to function both individually or arranged in groups, allowing a narrative to evolve. Andrea Geller attended Cornell University and received a BFA from Parsons School of Design, NYC. She earned an MFA from William Paterson University, NJ. Geller has exhibited at Emerge Gallery, NY; Renaissance Gallery, NY; Tapp's Art Center, SC; College at Brockport's Tower Fine Arts Gallery, NY; Ben Shahn Center for the Visual Arts, NJ; Artworks, NJ; Edward Hopper House, NY; Ramapo College, NJ; Paterson Museum, NJ; Banks Fine Art, TX. Her work is in many private collections.